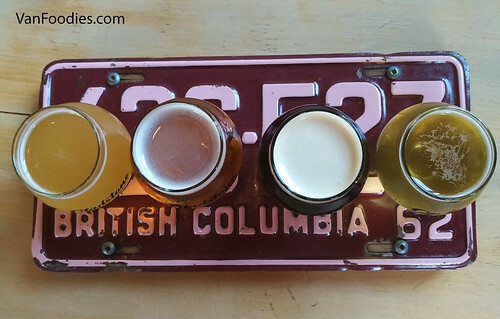 While we were staying in Courtenay, we learned that there were two breweries in town plus another one in Cumberland. 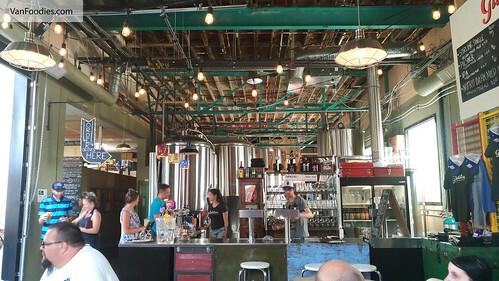 It was a very hot summer day and we needed some refreshing beer to cool us down, so we paid Gladstone Brewing a visit! 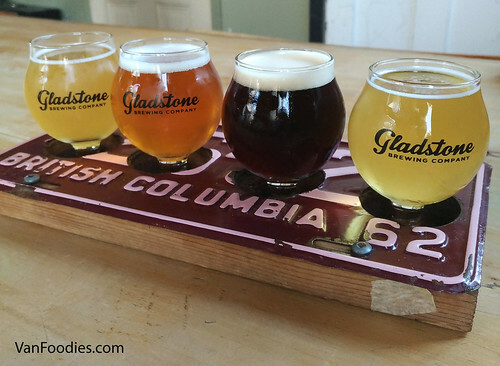 Gladstone focuses on Belgian ales, European lagers, and Pacific Northwest style India pale ales. The interior is quite interesting. It reminded me of an auto repair shop. In fact, its flight paddles are license plates mounted on a piece of wood plank. Stirling Single (4.5% ABV | 20 IBU): The Belgian ale was refreshing, slightly fruity with a citrus note. Nitro Dark Mild (3.2% ABV | 21 IBU): We were hesitant about ordering a dark ale on this hot summer day but it’s light and creamy thanks to the nitrogentation. It had a hint of malty note. Indian Session Ale (4.8% ABV | 45 IBU): It had a prominent grapefruit bitterness. It’s not very heavy and would be a good summer beer for those who enjoy a hoppier option. Gose (4.6% ABV | 10 IBU): Gose is similar to a Berliner Weisse, with mild sourness and a hint of salt. The one thing we missed out on, was the pizza. Pizzeria Guerrilla shares the space with Gladstone and the menu sounded amazing! We looked over to other customers and the pizzas looked delicious. Good sized pizzas, too! Overall, there was no surprises in the beer but we were happy with how they all tasted. A few good drinks in the Comox Valley.